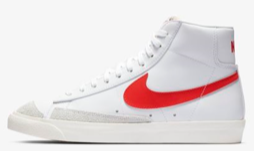 Nike Blazer was named after Portland’s basketball team and debuted in 1972. It was originally known to be a basketball shoe, but just like some other famous sneakers, the shoe became very popular among sneaker fans. It was a shoe that’s very fit for casual lifestyle wear and skateboarding. The Blazer is a popular 70s shoe. Nike has decided to make the shoe famous once again by presenting it in new modern looks. It’s been more than three decades since the first Nike Blazer was released. At the start of this year, the “Habanero Red” colourway was released. The silhouette is, no doubt, very cool. This good looking silhouette features white leather upper, traditional lacing, the green Nike swoosh logo on the white leather on both sides. It also features grey suede overlays on the midfoot and the toe box. Beneath the upper is a white rubber sole. The traditional Nike text branding can be found on the heels. Here is a guy talking about the shoe, mostly what he loves about the sneaker. He showed it on feet too. The Lucid Green and Habanero are already available for purchase in US, but the Lucid Green available date in the UK /EU is 14th of February, 2019. If you think the shoes worth having a look at, you will find the recent colourways on Nike. I love the information you’ve provided! Those shoes are beautiful as well! Cool trainers. Thanks for sharing. These would be good for my nephew, so I am going to buy these for his birthday in a months time. I love it when Nike goes retro, and they’re the kings of blending tradition with innovation. You can definitely see the vintage design here, complete with the colors, which reflect another era. I’m glad to see these making a comeback. Actually this is exactly the information that I was looking for about Nike shoes and when I landed to your website and read this post, it answered all my questions in details. So I’m happy that you decided to write about this topic and share it with people. It’s very useful and can definitely be used as a great review for Nike blazer. I will be glad to see you again. I usually publish, at least, 3 times a week. Let me know if you have any shoe in mind that you would like me to review.